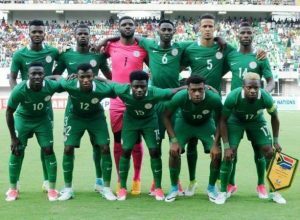 Three-time champions Nigeria flew majestically back to the biggest football house party on the African continent after being held 1-1 by South Africa in Johannesburg on Saturday. It was certainly not one of the classics, but the result meant only one other team in Gourp E (either Libya or South Africa) could end up with the same 10 points that Nigeria already have, by the of the qualification series in March 2019. But Libya’s 8-1 defeat of their hosts Seychelles on Mahé Island would create real fear in the Bafana Bafana going into that last battle against the Mediterranean Knights in Tunisia. At the FNB Stadium in Soweto on a sunny afternoon, Nigeria made the brightest start with stand –in Captain Ahmed Musa watching his shot held by goalkeeper Itumeleng Khune in the 6th minute, and two minutes later Nigeria had the ball in the net after a sweet combination by Musa and Kelechi Iheanacho. But Gambian Referee Papa Gassama ruled it off-side, on the prompting of the assistant referee. It became a ding-dong as the match gathered some vibrancy, with Captain Thulani Hlatshwayo arriving late for a free –kick and Mothiba wrong –footed, and at the other end, William Ekong’s run to a good chance from a corner was foiled and Kalu shot too high from an Ahmed Musa corner. Bafana were level in the 26th minute though, as the nimble –footed Tau, appropriately named Man-of-the-Match, left Ekong and Omeruo in no-man’s-land and drilled a selfless pass to Mothiba, beyond a sprawling Ikechukwu Ezenwa, to slot into an empty net. A weekend of South African diet continues on Sunday as eight-time champions and Cup holders, Super Falcons clash with the Banyana Banyana of South Africa in the opening match of Group B of the 11th Women Africa Cup of Nations.